It's all about making pots. 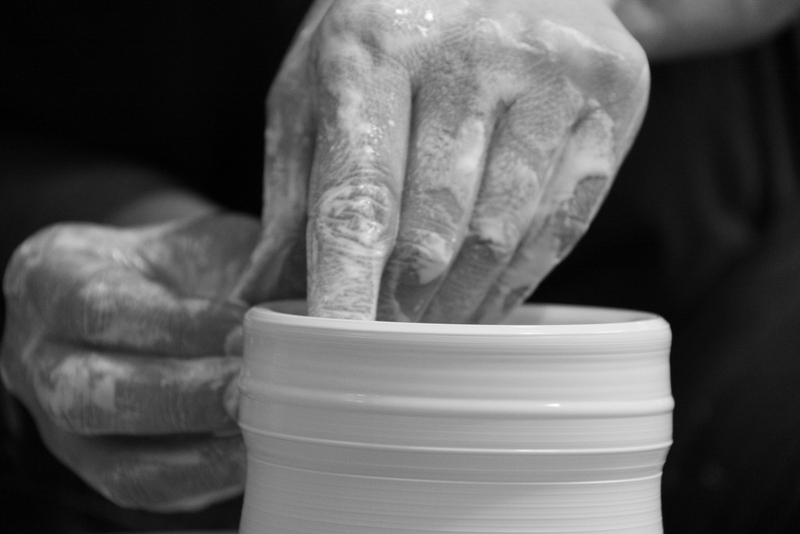 Working with clay is my escape button from a digital world in which I dwell during my day job. Leaving a virtual world and stepping into a physical one. Throwing and casting pots simply keeps my life in balance. The very first time I worked with clay felt like coming home - this was what I had been looking for. Although that moment is now more than two decades ago, the material clay continues to fascinate me. Due to its multifaceted nature, I am ofter tempted to try out new techniques, but in the end, I always come back to the wheel. The forms I make, seem to become more pure and simple over the years. I like experimenting with different decoration techniques : glazing, inlay, water etching, decals, ... Everything is fascinating. Recently I started following silversmithing classes so as to combine porcelain and silver. Although I have a strong bond with nature, inspiration usually comes from (non-ceramic) material objects around me. The result can be categorized as a 'urban style' of pottery.